Yes, it’s true! 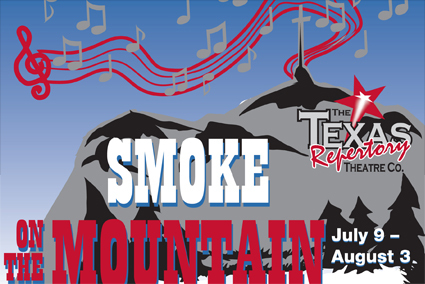 The fine cast of Texas Repertory Theatre’s recent production of “Smoke on the Mountain,” seemed really fired up as they delivered this spirit-filled tale of the Sanders Family Singers, who arrive one evening in 1938 to present the first Saturday Night Sing for the church-going country folk gathered at the Mt. Pleasant Baptist Church, somewhere in North Carolina, near the Blue Ridge Mountains. With the abundant bluegrass-style gospel music that would follow (27 familiar and traditional tunes, fully licensed for performance), it wouldn’t take long for a hand-clappin’ audience to be fired up as well. The charming story was written by Connie Ray and conceived by Alan Bailey, and in the original 1988 McCarter Theatre production, Miss Ray herself portrayed the character of June, while Mr. Bailey served as director. This Texas Rep production was skillfully assembled by guest director, Rachel Mattox. The lovely country church interior set design of McKay Talley has a sweet simplicity very appropriate to the late depression era, and it is nicely illuminated by the warm sunset lighting of designer David Gipson, who later creates a pleasant moonlit atmosphere (embraced by hanging moss) that must have pleased the crickets the audience could hear chirping. Into this cozy scene arrives our pastor, Rev. Mervin Oglethorpe, humorously portrayed by Jeff Lane. Oglethorpe is quite a conservative Baptist, but brave enough to risk trying the idea of a Saturday night of gospel music, for this congregation made up largely of folks who work at the local pickle plant that dominates the town economy. (One character quips: “This is the only town I know that smells like it ought to be on top of a hot dog!”) The real fun is watching the pastor cringe in horror when folks take the music a step too far with such dangerous behaviors as banging on tambourines or, heaven-forbid, dancing! So it is that we meet the singing Sanders family. There is shy June Sanders (Beth Hopp), who, with dead-pan expression, tells us of the incredible thrill of visiting the machinery room at the Fontana Dam. Hows that for excitement? She livens up the evening’s proceedings by hilariously using her talent to “sign” for the deaf, as she offers amusingly over-the-top gestures to accompany the words to each song, sometimes punctuating the songs with various percussion novelties from cymbals to scrub boards. The audience loved it. Hosting the evening’s entertainment in the role of Sanders family patriarch, Burl, is the musically talented Steven Fenley, who also happens to be Associate Artistic Director of the Texas Rep. company. Mr. Fenley’s rich voice and instrumental talents would be on full display throughout the performance, and he provides a characterization of Burl as a solidly convincing teller of tales, especially when he reminisces about the day the beer salesman came to his filling station. He hit’s a homerun leading the singing of, you guessed it: “The Filling Station.” What a riot! One by one the other members of the family would introduce themselves. As the piano-playing mother, Vera, velvet-voiced Shondra Marie is prim, serene, and appealing, even in her depression-dowdy dress, one of the show’s many fine period costumes. Her animated body language, while sharing the tale of the June bug, had the audience in stitches. Meanwhile, the Sanders twins, Dennis (Kyle Greer), and Denise (Rachel Logue)add to the fun. Dennis is a nervous, stammering young man who wants to be a preacher, but when he fiercely raises his Bible heavenward, he begins to show us that he may just have what it takes. And Mr. Greer has what it takes, too….to make us laugh! Meanwhile, his sister Denise keeps the laughter coming as she tells the story of how she auditioned with David O. Selznick for the part of Scarlett O’Hara in “Gone With the Wind,” with Miss Logue showing a great flair for comedy. The other brother, Stanley (Ted Doolittle), has his own poignant tale to tell, reflecting on life in prison that kept him from returning home to his mother. A touching, “Everyone Home But Me,” summed it up musically. Texas Repertory Theatre begins its 2008-2009 season with the musical comedy, “I Love You, You’re Perfect…Now Change,” with performances September 17th thru October 5th. For tickets and information call 281-583-7573 or visit the website at www.TexRepTheatre.org.